A nail bomb was discovered in Potsdam, Germany on Friday evening. It had been posted via delivery firm DHL in an extortion attempt. Police defused the device, but warned similar incidents could follow. The surge in post around Christmas makes the risks more intense. 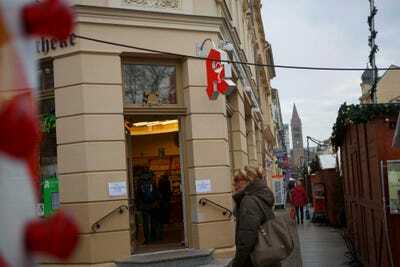 Police are warning people to be suspicious of Christmastime packages after a nail bomb delivered to a pharmacy was diffused by police in Germany on Friday. Officials in Brandenburg, Germany, highlighted the risk after delivery firm DHL was tricked into delivering a box stuffed with explosive powder, electronics, and nails to a town centre just outside of Berlin. A Christmas market in Potsdam was evacuated on Friday after staff in a pharmacy opened a package to find the makeshift bomb. Police were able to defuse the device without it going off, and nobody was injured. A report by European news site The Local suggested that the bomb malfunctioned. Getty ImagesThe pharmacy where logistics firm DHL unwittingly delivered the bomb. But the apparent ease with which criminals were able to get a bomb inside the postal system prompted authorities to warn that the Christmas season could provide cover for similar attempted attacks. He warned people to be wary of opening unexpected packages, especially those without a return address, those featuring illegible handwriting, and any boxes with stains or protruding wires, DPA said. At the news conference on the incident, police described the incident as an attempt at criminal extortion, rather than a terror attack. Officers, per DPA, said that the suspects issued a ransom note to DHL demanding millions of euros after making them aware that there were explosives in their postal system. The suspects are believed to be from Berlin.